Introduced shrub or small tree often with crooked or leaning trunk, dense crown of low branches, silvery foliage, and sometimes spiny twigs. Height: 20' (6 m). Diameter: 4" (10 cm). Leaves: 1 1/2-3 1/4" (4-8 cm) long, 3/8-3/4" (10-19 mm) wide. Lance-shaped or oblong; without teeth; short-stalked. Dull gray-green with obscure veins above, silvery, scaly, and brown-dotted beneath. Bark: gray-brown; thin, fissured and shedding in long strips. Twigs: silvery, scaly when young, becoming reddish-brown; long and slender; often ending in short spine. Flowers: 3/8" (10 mm) long; bell-shaped; with 4 calyx lobes, yellow inside, silvery outside (petals absent); fragrant; short-stalked; scattered along twigs at leaf bases; in late spring or early summer. Fruit: 3/8-1/2" (10-12 mm) long; berrylike, elliptical,yellow to brown with silvery scales, becoming shiny; thin, yellow, mealy, sweet edible pulp; large brown stone; scattered along twig; maturing in late summer and autumn. Ecological Threat: Russian-olive can outcompete native vegetation, interfere with natural plant succession and nutrient cycling, and tax water reserves. Because Russian-olive is capable of fixing nitrogen in its roots, it can grow on bare, mineral substrates and dominate riparian vegetation where overstory cottonwoods have died. Although Russian-olive provides a plentiful source of edible fruits for birds, ecologists have found that bird species richness is actually higher in riparian areas dominated by native vegetation. Biology & Spread: Establishment and reproduction of Russian-olive is by primarily by seed, although some vegetative propagation also occurs. The fruit of Russian-olive is a small cherry-like drupe that is readily eaten and disseminated by many species of birds. History: Native to Europe and western Asia, a recent (early 1900s) arrival in the upper part of the Southeast. Initially planted as a yard ornamental, for windbreaks, surface mine reclamation, and wildlife habitat. U.S. Habitat: Found as scattered plants in forest openings, open forests, and along forest edges. Thrives in sandy floodplains. Shade intolerant. Spreads by bird- and other animal-dispersed seeds. A nonleguminous nitrogen fixer. Distribution: Native of S. Europe and Asia; planted and naturalized from British Columbia east to Ontario and from New England west to Texas and California; to 5000' (1524 m) or above. When restoring areas previously infested with Russian-olive, use shrub and tree species native to the particular region and ecosystem. Native plants provide the choicest shelter and food for wildlife. Mowing hedges with a brush type mower, followed by removal of cut material may be the most effective method for eradication. Herbivorous animals are not known to feed on it and few insects seem to utilize or bother it. Canker disease is occasionally a problem but not enough to be useful as a control agent. Knopf, F.L., and T.E. Olson. 1984. 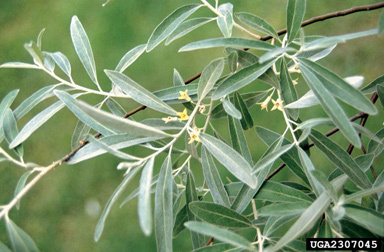 Naturalization of Russian-olive: implications for Rocky Mountain wildlife. Wildlife Society Bulletin 12:289-298. Shafroth, P.R., G.T. Aubla, and M.L. Scott. 1995. Germination and establishment of the native plains cottonwood (Populus deltoides Marshall subsp. moniifera) and the exotic Russian-olive (Elaeagnus angustifolia L.). Conservation Biology 9:1169-1175.